Check out this game..test your skills at multitasking on the roads.. Thanks, very interesting, Dee. I'll pass on the game for today (might try it later, tho); most of the time when I'm driving I'm going to teach business English classes and am preparing classwork in my head at red lights so ... wonder if the road sign really exists, maybe they should put up more? It's dangerous enough that people talk on the phone while driving - but now they are texting as well. Other then emergency I see no reason for talking on the phone while driving. Even the best and most alert driver will be distracted by phones and texting while driving should be illegal. Telephones and text messages should not be part of driving. I have already been the victim of an accident with a teenager totally absorbed in his cell conversation and not watching the road. Driving is an activity that needs all of your attention. The only problem I have with people talking on the phone or texting while driving is that it puts OTHERS in danger. If that weren't the case, I think it might be helpful. The Darwin awards would more active and the average intelligence level in the U.S. might rise a bit. I don't know what it's like where you all live, but I've noticed most of the idiots who are clearly paying more attention to their damned phone call than traffic are driving escalades, navigators, denalis, expeditions, (I call them idiot mobiles) etc. Bad enough they're endangering everyone else by being distracted while driving, but that they're also driving these massive mechanical monstrosities puts others yet further in danger. When they cause accidents by doing this, I think they should have their licenses permanently revoked, their SUVs confiscated and should serve jail time for reckless endangerment, criminal mischief, or some sort of weapons charge. Despite the risks, the majority of teen drivers ignore cell phone driving restrictions. In 2007, driver distractions, such as using a cell phone or text messaging, contributed to nearly 1,000 crashes involving 16- and 17-year-old drivers. Over 60 percent of American teens admit to risky driving, and nearly half of those that admit to risky driving also admit to text messaging behind the wheel. Over one-third of all young drivers, ages 24 and under, are texting on the road. Talking on a cell phone causes nearly 25% of car accidents. A study of dangerous driver behavior released in January 2007 by Nationwide Mutual Insurance Co. found that of 1,200 surveyed drivers, 73 percent talk on cell phones while driving. The same 2007 survey found that 19 percent of motorists say they text message while driving. In 2005, the National Highway Traffic Safety Administration found that ten percent of drivers are on handheld or hands free cell phones at any given hour of the day. A study conducted by the Insurance Institute for Highway Safety Motorists found that motorists who use cell phones while driving are four times more likely to get into crashes serious enough to injure themselves. 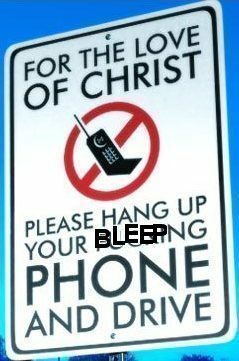 In the UK it is an offence to hold and use a phone whilst driving. I think I remember being told that 40% of accidents involve at least 1 driver using a phone. This is not multitasking, it is a distraction. Two hands are needed to dial or text and which hand holds the wheel? To properly control the car you should have 2 hands on the wheel. Then, as you are dialling or texting, who is watching the road? If your attention is not totally on the road then you can easily miss someone pulling out, across, over taking, stepping out on the road, opening a door, a stop sign or a red light. If you have someone in the car, they can also see what is happening but if they are on the phone they can't and the driver can become distracted. I agree that there is no reason why you shouldn't have one in the car for emergencies or whatever, but do not use it. I've seen the videos of what happens with people on the phone when driving, just be patient, nothing is that important that it cannot wait until it is safe for you to pull over and stop or arrive at your destination. We managed before mobile phones, we can continue to manage without them. While driving a vehicle..one should have full attention on their driving..and nothing else..
An accident takes just a moment to occur..and not only can..and does it result in many accidents..but in many deaths..
You look away for just a second and anything can jump out..Other cars..pedestrians..animals..These people who think it is safe and or wise to text..talk..on cell phones..are accidents waiting to happen.. I love the sign. If they are not careful, they may be seeing Jesus sooner than later. It is irresponsible for them to think they are so omnipotent that they can do anything they want behind the wheel. Over estimating themselves is the fastest way to realizing that they have just killed someone and/or themselves. "Almost 50% of all drivers between the ages of 18 and 24 are texting while driving. Over one-third of all young drivers, ages 24 and under, are texting on the road." Ugh, that bad? Hate to say it, but it might be time to sell my Harley. I'm an ex-cabbie (cabbies have conversations with their passengers, listen to the music radio, monitor and talk on the dispatch radio AND watch the road at the same time), and a student pilot (pilots must maintain communications with a variety of radio frequencies, fly the plane and regularly scan the horizon for traffic and a variety if cockpit instruments), and I still know better than to text while driving. I also don't answer my call phone while driving (well, usually, anyway). Thomas there is a difference between flying a plane while your co-pilot talks and holding/using a mobile phone. Cabbies do not have to listen to the radio and talk to the passengers but I do that anyway while I am driving but the quality of conversation is different and sometimes erratic depending on the road conditions. Dispatch radios do not require you to dial a number or text but you should be careful while using it. But then the quality of cabbies driving - anywhere in the world - is debateable! as a lifelong pedestrian, i say "SHUT UP AND DRIVE!" and hands free has been shown not to be a solution; it is the conversation that distracts. belt in the kids, confine or restrain the pet, eat your meals, dress, and do your makeup at home, fiddle with the music at red lights only, and put your flipping phone away! that's a two ton box of metal you're aiming right at flesh and bones little me, so pay attention to the task at hand, please and thank you.